Canberra Sep 14 (IANS) Australian Prime Minister Scott Morrison has apologized for using an explicit rap song in a video posted to his social media accounts. 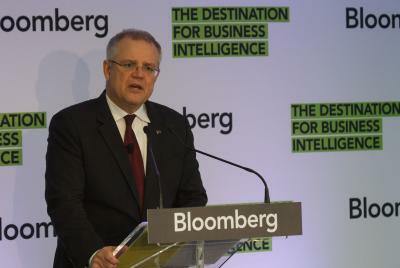 Morrison had posted on Thursday a 11-second clip of the song 1999 s "Be Faithful" by rapper Fatman Scoop over quick edits of his parliamentary allies raising their hands in response to a question asked by him. The video was accompanied by a comment saying "QT (Question Time an Australian parliamentary session) was on fire today... Good work team." The comment was followed by a flame emoji. The song has explicit language and sexual references. However the section posted on Morrison s social media accounts was not explicit: "You got a hundred dollar bill get your hands up! You got a 50 dollar bill put your hands up!" Australian Twitter rejoiced in the poorly chosen song with trade unionist John Setka tweeting: "Hey Scott. I hear you might have mucked up on one of your tweets? Don t let it get you down it happens to the best of us." The tweet -- and Facebook post -- have since been deleted and Morisson posted again saying that when he found out the content of the song he had asked for it to be taken down. "The full lyrics of the song used in my earlier video from (Question Time) today were just not OK. When I found out I asked the team to take it down. Apologies " Morrison wrote. According to Australian national broadcaster ABC he defended the post saying it was a "bit of fun " and not a song that he would typically listen to himself. Morrison became the country s 30th Prime Minister -- and the sixth in just a decade -- following his victory in a leadership vote in August.